These postcards are a key part of the Z-NET Blueprint process, and are used by the participating communities to consider and identify their preferred solutions. A tailored version of the postcards will be created for each new town or village as part of their work to become a Zero Net Energy Town. 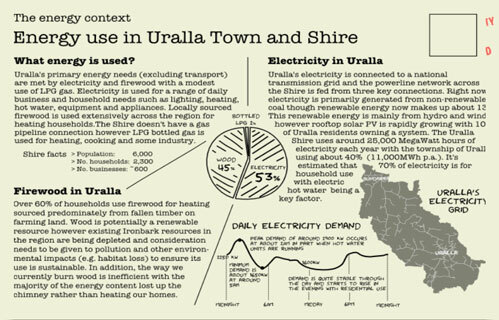 This collection of postcards were created for Uralla (the Z-NET Case Study) to explain their context and options ~ reduce energy consumption, generate clean energy on-site or nearby, or to import clean energy. 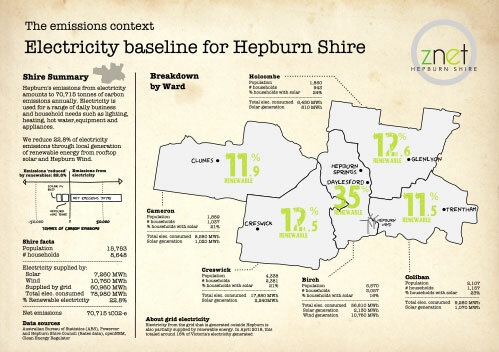 This collection of postcards were created for Hepburn Shire to explain their context and options ~ incorporating agriculture, buildings, electric transport and energy storage. The aim being zero net emissions. The Z-NET Technical Model is the mathematical machine which holds things together. It incorporates a town’s current energy footprint and analyses the merits ~ both energy-wise and financially ~ of the various options available to reduce and produce energy. Our long-term goal is to make this tool available using an open and crowd sourcing platform so that it is much more user friendly for towns and villages to use. At this stage a town or village is likely to require a highly competent technical team to be able to accurately use this. The Z-NET Blueprint was developed at the same time as creating a plan for Uralla ~ the Z-NET Case Study Town. This approach has given the model a very practical and ‘real world’ grounding, and includes a business case assessment to quantify the costs, benefits, opportunities and risks of the various options available. The Uralla Case Study can give you a clearer sense of how Z-NET might work for your community.